There are several little pocket neighborhoods or strips in Denver. I enjoy visiting these areas for a meal and some boutique shopping. This past weekend I had the pleasure of visiting South Gaylord Street in Washington Park (Wash Park) for brunch with a friend of mine. I have only ever eaten at Devil’s Food on this strip, which is delicious! 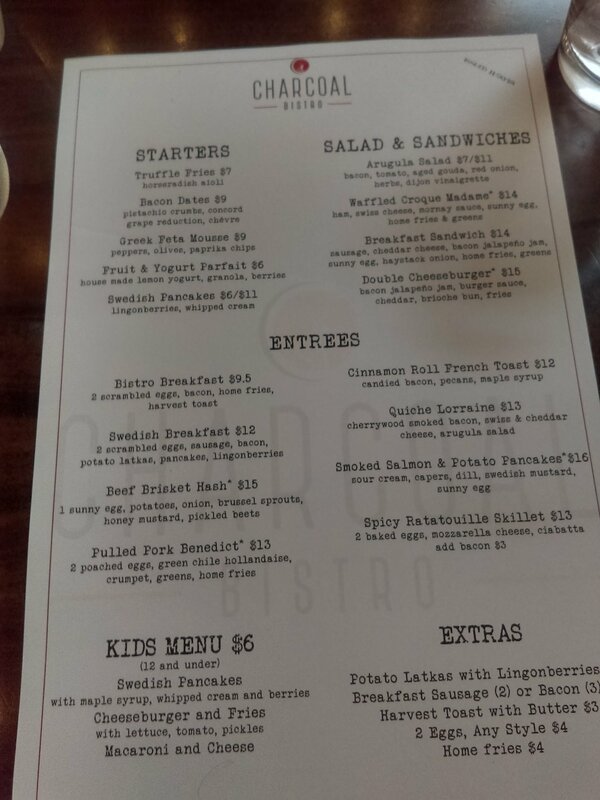 This visit we had brunch at Charcoal Bistro, the brunch menu looked amazing and it did not disappoint. I am a vegetarian but can normally find something great to eat. I got the Swedish Breakfast without the meat which consisted of scrambled eggs, potato latkes and mini pancakes with lingonberries. The meal was delightful! I had never had a lingonberry, they were very good. Not very sweet but not bitter either, somewhere in-between. The potato latkes were wonderful, I was very happy with my meal choice. The ambiance of the bistro is lovely. I will definitely revisit. We stopped by a couple of shops after we ate, The Paper Lady, The Tended Thicket and Silk Road. The Paper Lady is a very cute card and stationary store. If you need a little gift or card this is the spot to visit. There are a lot of cards, notebooks and knickknacks to choose from. I always enjoy meandering around this little store. The Tended Thicket is one of my favorite stores in Denver and I want to buy everything. They have home goods, soaps, scarves and clothing, seasonal decor, small men’s section, baby section, outdoor goods and much more. It’s a great boutique to get a gift or something for yourself. There are many items that are European or have an European feel. I recommend stopping in! Silk Road has a lot of various artisanal items from woman’s clothing to dishes to baby items. There is a lot in this store and it can be a bit overwhelming but a good place to grab a gift for someone. I’ve been to Wish Boutique and W Boutique, both are very cute and have a good variety of clothing and accessories for women. Sometimes they have events and activities happening. Check out their website for more information http://www.oldsouthgaylord.com/.